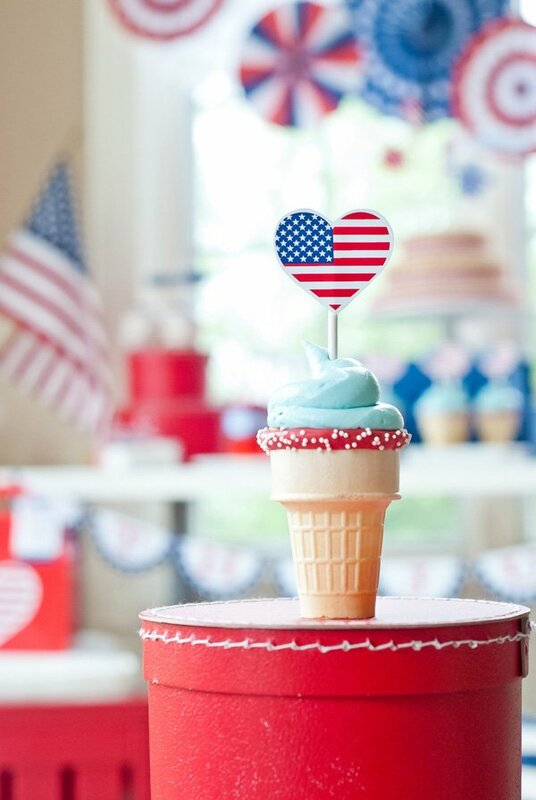 – Crowd-pleasing ice cream cone cupcakes with sprinkled chocolate rims and American Flag Heart toppers. 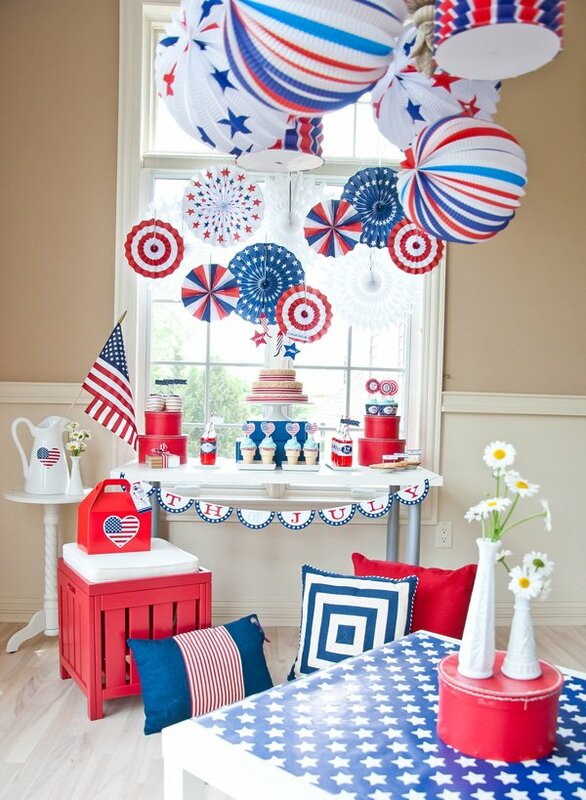 – Budget-friendly patriotic decor like a dollar store paper fan backdrop and star-print wrapping paper table runners! – Individually packaged and ready to roast s’mores kits + favor boxes with star cut marshmallows. 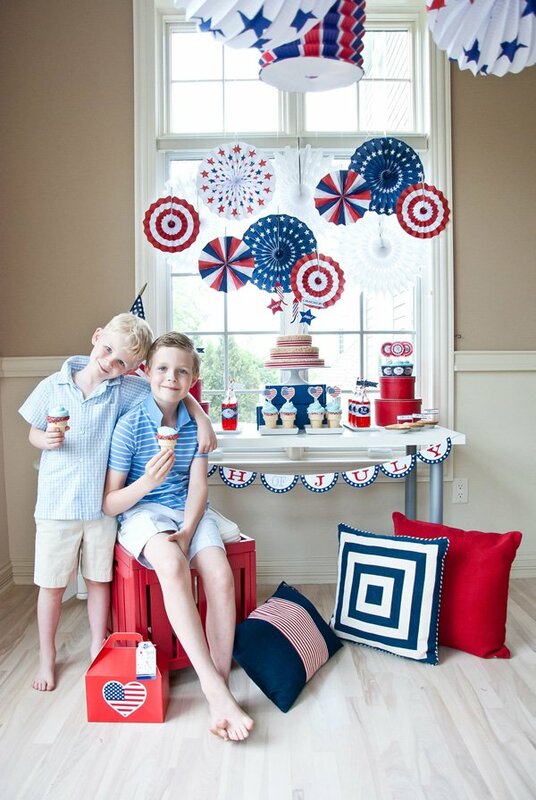 What could be more patriotic than stars, stripes in classic red, navy, white? 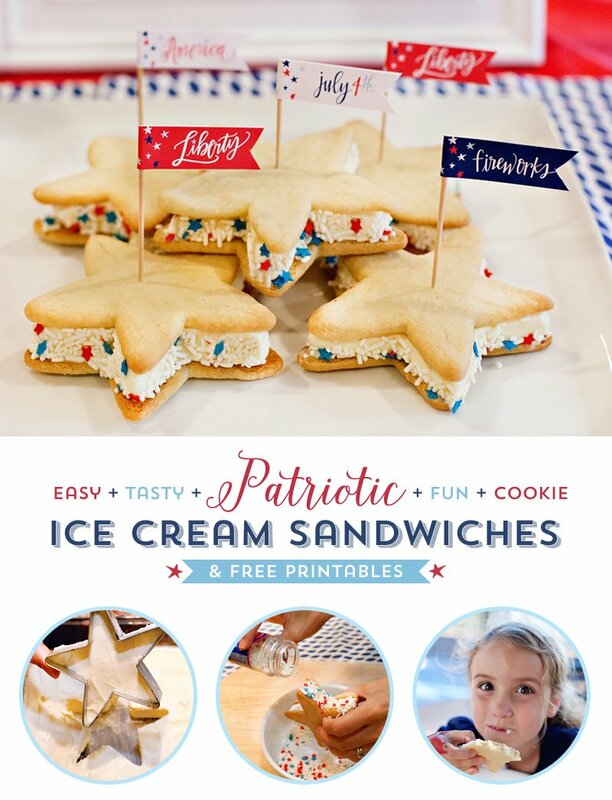 Throw in apple pie, “Ice cream” (aka Ice cream cone cupcakes), s’mores, candy apples and daisies and you have an all American celebration that is sure to please! 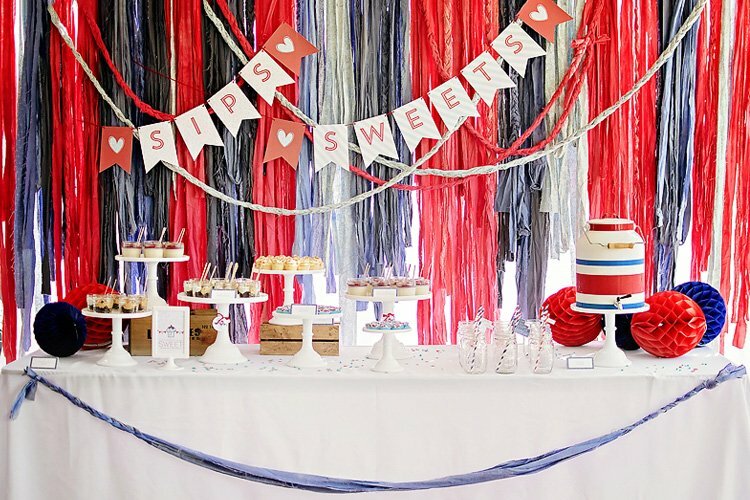 We put together this All American 4th of July Party in less than 2 days! 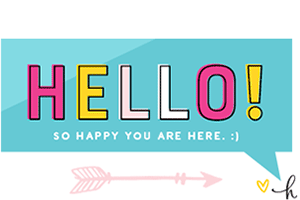 Designing the printables, decorating, DIY’ing, baking, photographing…. it was fun! This really is a low budget type party! For the dessert table backdrop, we used Dollar Store bought paper fans mixed with tissue paper fans to create a dramatic and eye popping backdrop. For under $15, this backdrop adds a pop of color to the room. The dessert table had a very simple look with varying heights to display the desserts. Using red and navy boxes for height, the contrast with the white desk was clean and simple. 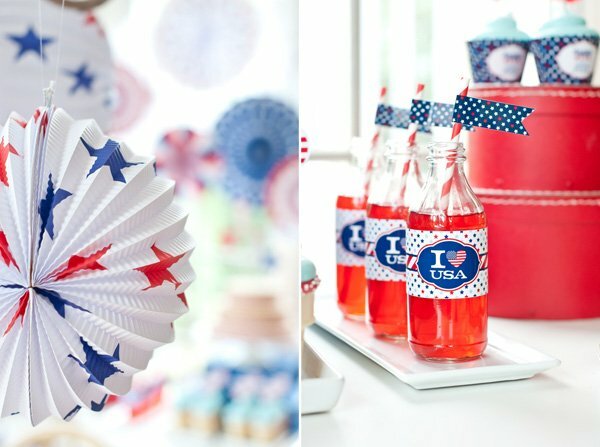 We used items from our house (Ikea desk from my son’s room, navy memory boxes from my office and red hat boxes that we have used for other parties) and so the party was very inexpensive! 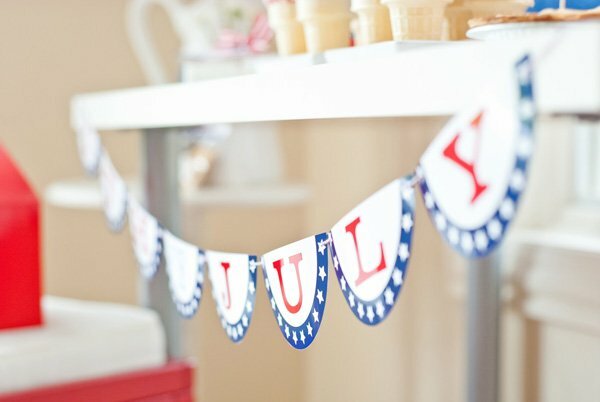 The banner we designed from our new All American printable collection has the look of the classic half circle flags that lots of Americans love hanging on their front porches. 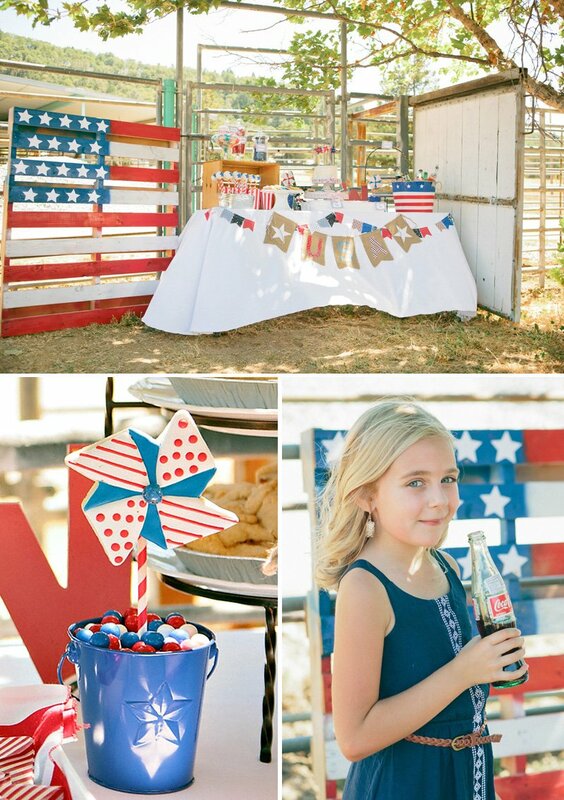 We love that look and the banner resembles that signature American Flag look. – Place the mini cupcake (wrapper off) into the top of the cupcake (it fits perfectly! ), and add a beautiful piped icing. 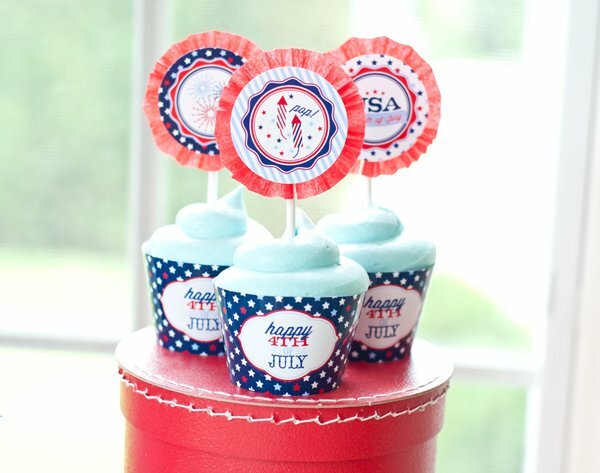 – Top off with a printable heart shaped party logo from the printables on top to make it really 4th of July and All American! 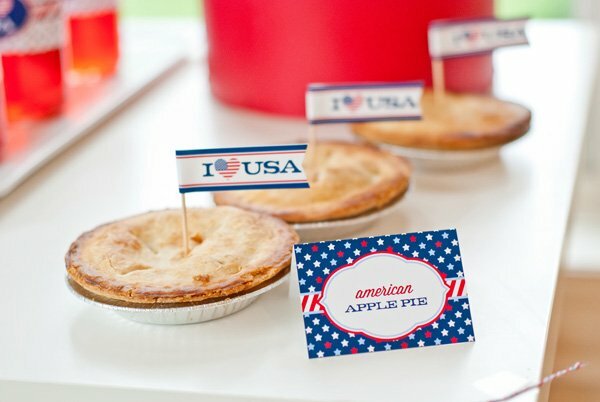 Every patriotic party that is about America needs some good old apple pie. We served mini pies with party flags sticking out of them. So cute and simple! 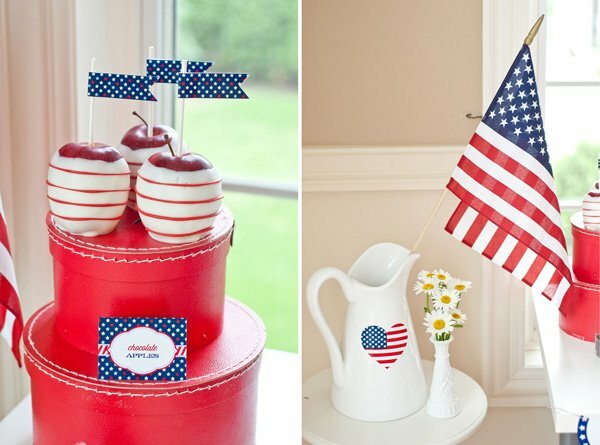 We dipped apples in white chooclate and then drizzled with red chocolate stripes and topped with a party flag. 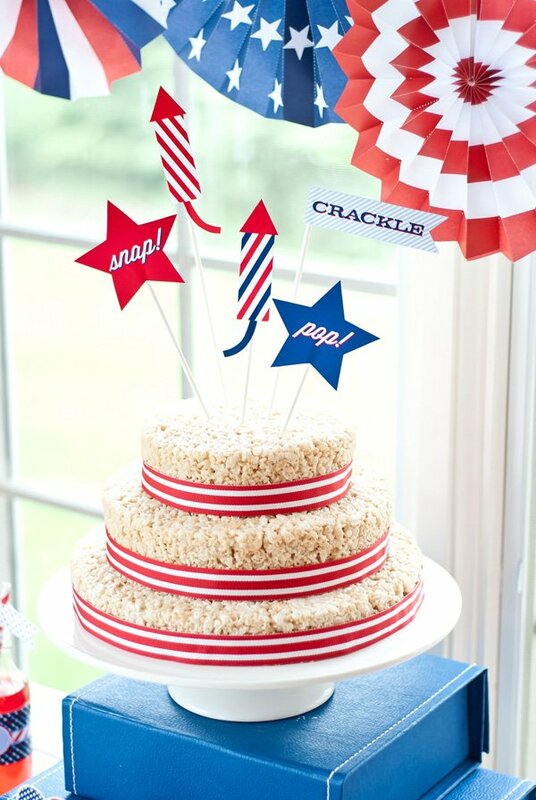 Again, an “All American” treat! Regular cupcakes were also served and were wrapped with our printable cupcake wrapper, and topped with a crepe paper ruffle matted party logo from the printable set. See instructions on how to make the ruffle crepe paper backing here. 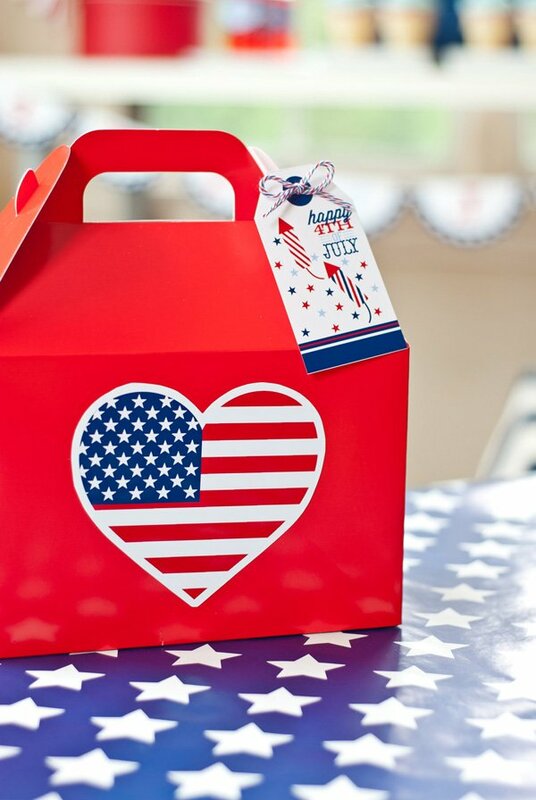 Adorable Red Gable Boxes were embellished with the heart flag printable logo and we added a printable favor tag to the side. 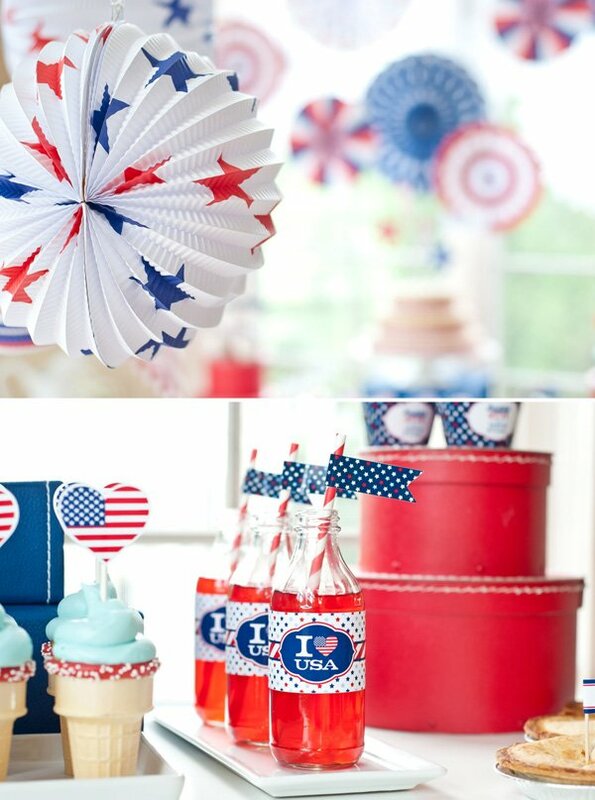 These were perfect for the group to pack up some treats and some sparklers, etc to take home as a favor! 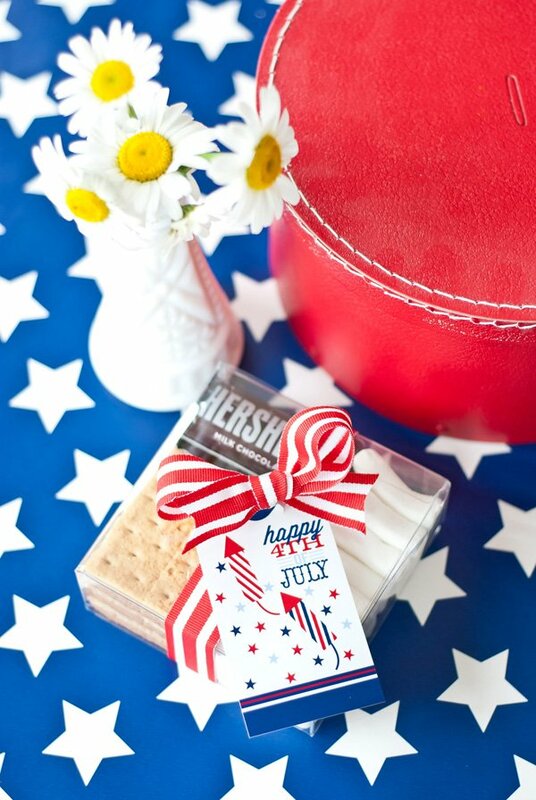 S’mores kits were also labeled with the favor tag and red and white striped ribbon. The cute clear boxes that we packaged the s’mores were from Nashville Wraps. S’mores were also packaged in cellophane bags from Nashville wraps and topped with our new printable bag topper. 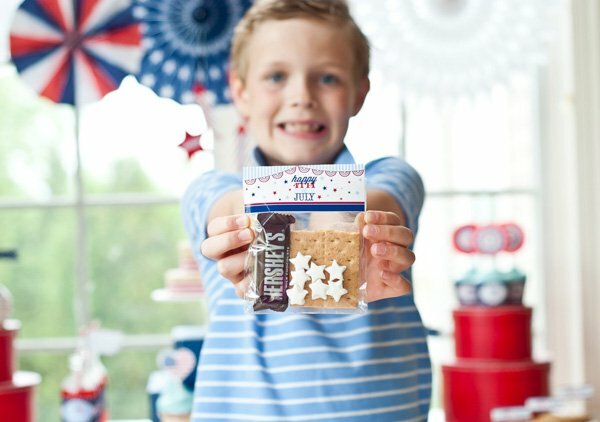 These are an easy way to distribute the makings for delicious s’mores for each of the kids before the party chaos begins. We actually used a mini heart cookie cutter to punch out star marshmallows, too! 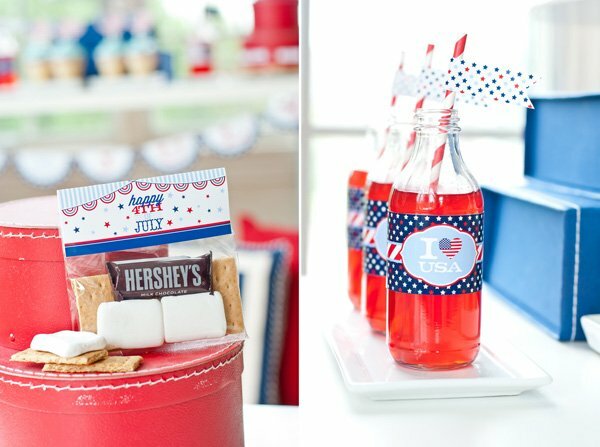 The kids loved the “patriotic punch” that we served (ie. red fruit punch) in glass bottles with a drink wrapper and party flag embellished straw. 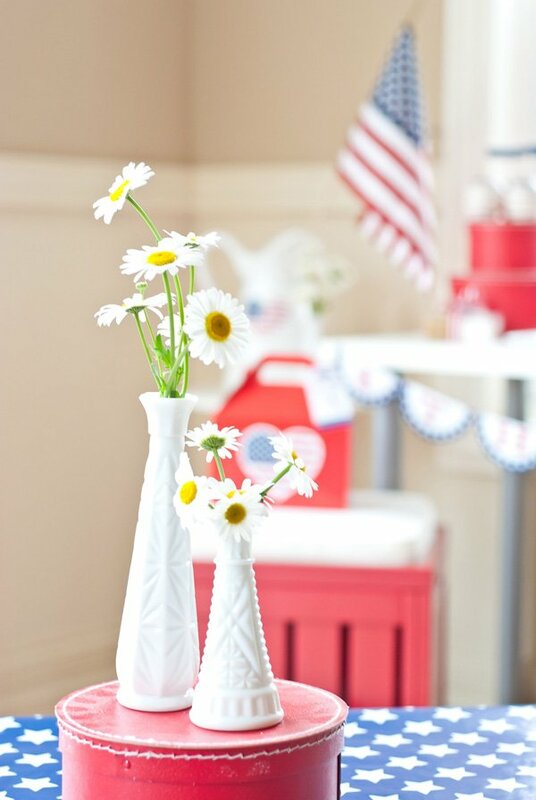 Classic daisies from my garden were cut and put in milk glass vases around the room, as well as American Flags. 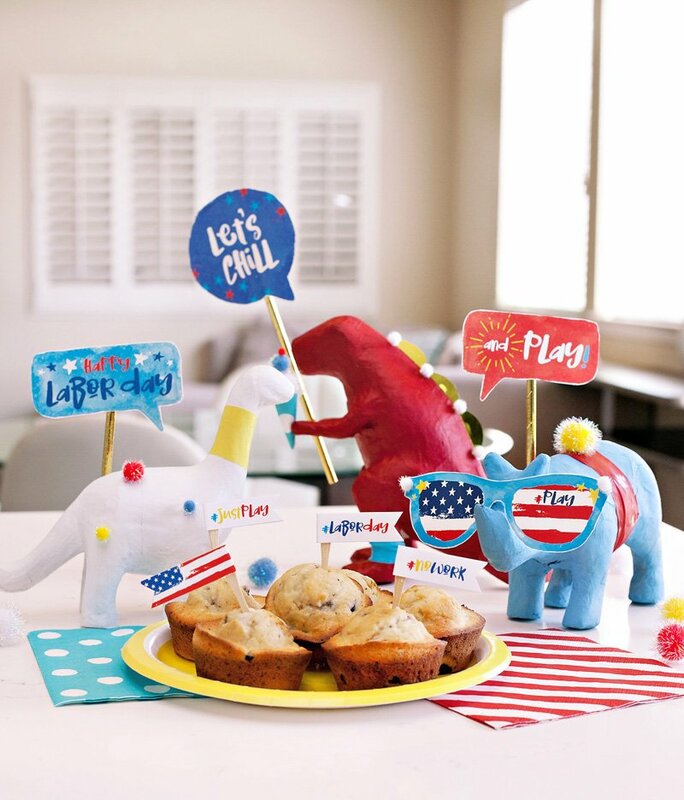 Can’t beat an “All American” party to kick off the summer! Theese are all great ideas! 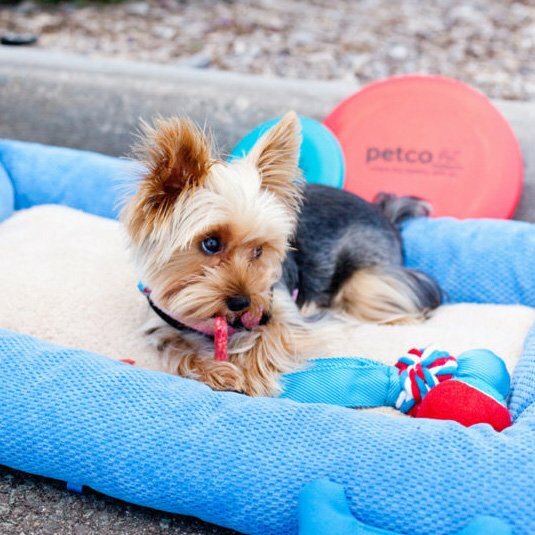 I really like the little s'mores packages…they might come in quite handy.